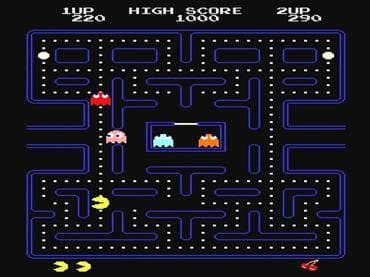 Classic Pacman game offered for free. Use the arrow keys to manuover Pacman around the maze. Complete the level by eating all the dots. Avoid the monsters, if they catch you you will lose a life. Eat the big power dots, and the monsters will temporarily turn blue, meaning that you can now eat them Download free game today and and start playing classic Pacman now! Free Game features: - Large screen area, a custom full screen mode of play; - Better graphics, for everything; - Sound samples of 16kHz; - All the intermissions, all the fruit, all the sounds; - Much improved joystick support; - Ghost movement closer to original game. Если у Вас есть вопросы, связанные с игрой Pacman пожалуйста используйте эту форму для связи с нами.